YOU ARE HERE:Home » Investing Commentary » How Do Robo-Advisors Work? How Do Robo-Advisors Work and What are Robo-Advisor Algorithms? Robo-advisors have stormed onto the investment scene as a way for all investors to participate in the wealth-building possibilities of the markets. 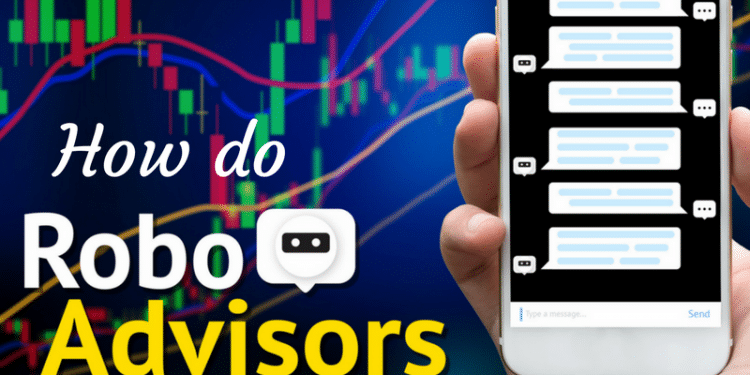 Finally, get the answer – How do robo-advisors work? No longer do you need deep pockets to hire a financial advisor or to invest in a professionally managed portfolio. From Betterment to Schwab or M1 Finance, the robo-advisory choices are vast. But, if you’re wondering “What is a robo-advisor and how do they work? read on. A robo-advisor is an investment manager that uses computer programs to professionally invest your money. Beyond that, there are many varieties of robo-advisors with diverse fees, investment minimums and features. If you’re interested in a low-cost, professionally managed investment approach, then a robo-advisor might be for you. Synthesizing algorithms has been the backbone of successful programs in various fields. Waze and Uber are known for their transportation algorithms and Google for its search engine algorithms. An algorithm is a fancy word for the process that a computer uses to solve a problem. A robo-advisor’s computer algorithm is the steps the computer takes to create your investment portfolio. Computerized algorithms are perfect for investors due to their inherent efficiency and cost-effectiveness. And, picking investments based upon the best-practices investing research can actually be done better by a computer than a human. Find out; M1 vs. Betterment – Which is the Best Robo-Advisor for Me? At first glance, the robo-advisor concept might seem doubtful and risky. After all, traditional investment management was grounded in meeting with a financial advisor, coordinating with a stockbroker, or even becoming your own financial manager. In contrast, most robo-advisors were founded on Nobel Prize winner Harry Markowitz’s Modern Portfolio Theory, which explains how to create diversified investment portfolios with the greatest returns for each risk level. So how do robo-advisors work? Robo-advisors are computerized financial advisors that excel in one thing: creating diversified investment portfolio following sound computer algorithms based on well-recognized modern portfolio management strategies. These automated advisors ask you your age and a few questions about risk, goals and your time horizon. Then the platform runs your choices through their algorithms. Next, you’re assigned a risk level ranging from conservative to aggressive. Most robo-advisors divide their investment portfolios by risk. So, based upon your risk level, from conservative through aggressive, you’re provided with a collection of investments, in specific proportions, that meet your criteria. So, for example, a young, aggressive investor might receive a recommendation for 90% stock investments and 10% bonds, like this one from Betterment. Each of the colors on the “recommended allocation” circle represents investments in various exchange traded funds. 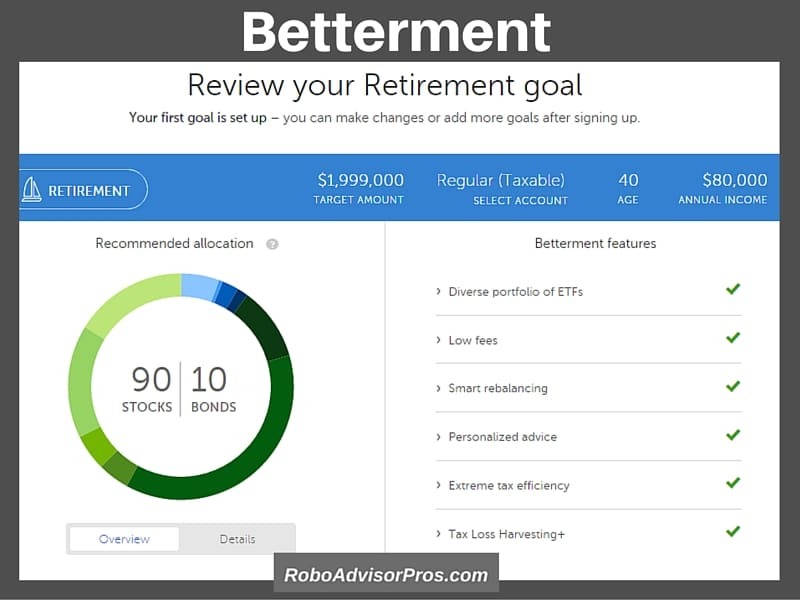 For example, Betterment, one of the oldest robo-advisors, creates your collection of investments according to your goals and risk tolerance from conservative to aggressive. The aggressive portfolio above is for the retirement goal. These are the exchange-traded funds available in the Betterment investment portfolios (caveat; funds are subject to change). More conservative portfolios hold a larger percentage of bonds and the aggressive portfolios are more stock fund-heavy. Most robo-advisors invest your money in exchange-traded stock and bond funds. Some companies also include commodity, real estate and other types of ETFs as well. The list of investments offered within each company is a distinguishing feature of specific firms. Small and mid-cap value stock funds and foreign emerging market bonds differentiate Betterment’s investments list from competitors. Other companies might not have the value offerings but might include U.S. and global real estate ETFs or commodity funds. 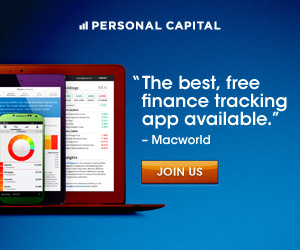 Explore; Should I Sign up for Betterment? Robo-advisors come in different categories giving clients a wide range of options. Currently, there are approximately 12 most popular robo-advisors. They differ regarding key features, free services provided, minimum investment amounts and more. Depending upon your preferences, there are many varieties from which to choose. From WiseBanyan, a free robo-advisor suitable for beginners to Wealthsimple or Betterement, low cost robo-advisors with access to financial advisors, there’s a robo-advisor for everyone. All robo-advisors rebalance your investments. That means if the proportions of your funds drift from your original choices, the service will buy and sell shares to return the portfolio to your preferred allocation. So, let’s say you start with a 60% stock and 40% bond asset allocation. Assume that stocks increase in value, more than bonds and your portfolio percentages grow to 70% stocks and 30% bonds. The platform will sell some stocks and buy more bond funds to return to your pre-decided 60% stock – 40% bond mix. Many robo-advisors sell losing investments and replace them with others, to offset gains and reduce your tax bill. This is called tax loss harvesting and is a strategy for taxable investment accounts. Choose a robo-advisor in under one minute with our Robo-Advisor Selection Wizard! 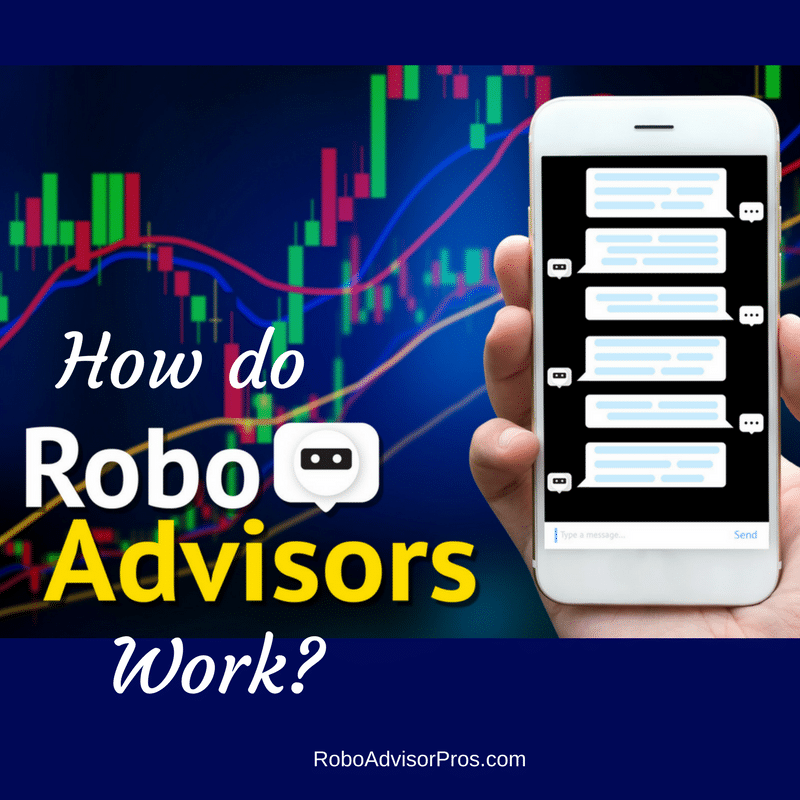 Other robo-advisors provide users with access to financial advisors for investment-related questions. There’s usually an additional fee for this service, although not always. Betterment allows users to text with robo-advisors for it’s .25% management fee and to speak with certified financial planners for their Premium Plan that costs .40% of assets under management. Wealthsimple includes financial advisors in their basic .50% management fee. For accounts over $100,000, the management fee drops to .40%. From Ellevest, designed for women investors to M1 Finance, the free robo-advisor with thousands of investment options, there’s a wide range of choices. Blooom is a robo-advisor that only manages your 401(k) investments. You pay $10 per month and Blooom chooses the lowest cost funds from the available choices. Qplum offers hedge-fund like robo advisors. Their fees are lower than those of typical hedge funds and you don’t need a six-figure portfolio to invest. If you’re interested in socially conscious investing, there are several robo-advisors that offer impact investing portfolios; Betterment, M1 Finance, Grow App and Wealthsimple. Finally, if you’re interested in more specialty robo-advisors, I recently wrote an article at U.S. News and World Report about “The Ways Robo-Advisors Stand Apart”. Robo-advisor fees are typically lower than stand alone financial advisors, and that’s part of their allure. Robo advisory management fees start with free platforms at Schwab Intelligent Portfolios and Wisebanyan. After that they range from .15% of assets under management on up to approximately .87%. The higher fee robo-advisors typically offer more features. The investment minimums also vary from zero at WiseBanyan to $50,000 at Vanguard Personal Advisor Services. Check out our Robo-Advisor Comparison chart (sign up at the bottom) to review the range of management fees and minimums. If you are seeking low-cost, research supported investment management, then a robo-advisor makes sense. Even if you’re a DIY investor, there’s little reason not to investigate the free M1 Finance robo-advisor. You’ve learned that robo-advisors have both similarities and distinctions. Yet, if you’re seeking a low cost alternative to a traditional high fee financial advisor, then a robo-advisor provides an alternative. For help wading through the vast pool of robo-advisors, check out our free Robo-Advisor Comparison chart, sign up below. Finally, click on any company listed on the side-bar for expert robo-advisor reviews. What federal and state certifications do robo-advisors have? Hi D, The best way to uncover that information is to visit a specific robo-advisor website and read their “legal” and “disclosures” section. For example, most robo advisors are registered investment advisors and subject to strict laws that govern the entire investment industry. Most will complete an ADV form which isthe uniform form used by investment advisers to register with both the Securities and Exchange Commission (SEC) and state securities authorities.